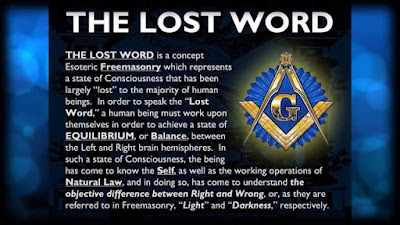 The Illuminatus Observor: The Illuminati and the Masonic "G"
The Letter G provides yet another opportunity to peer into the "Philosophy of the Illuminati", and in the process, shed light and provide additional reflections on that which is called "the Construct". Just what is "the Construct"? The "Construct" is a philosophy set into the Alphabet and then fused to, essentially, every thing. In order to accomplish this, a series of mathematical based ciphers, archetypal based ciphers, trans-cultural ciphers, and so forth, were employed. The purpose of all these ciphers was to preserve into the language the essence of what Osirian priest crafts viewed as "the Truth", and to do so in such a way as to expose the lies of "Satan", translated as Jehovah/Typhon/Seth. Before you can ascertan what is, or what is not, "the Truth" - as it has been crafted, it is absolutely essential that you begin to establish your esoteric and philosophical foundation. How you go about establishing your foundation is really your business - what we provide you with is the foundation as it was constructed within the Hermetic Arts and fused to the English Language. Based as it is on a series of ciphers, its eluecidation eludes many, but its wisdom has served as a guidepost for generations of those who seek to improve the state of our Western civilization and the world at large. "Therefore God had pity on them; and when He saw them fallen before the gate of the garden, He sent His Word to our father, Adam and Eve, and raised them from their fallen state." In addition to the Lost Word, Omnific Word, "the Word", or whatever it is you wish to name same, there remains a geometric component known as "the Philosopher's Stone". As a series of modifications and transpositions, the Philosopher's Stone may be inferred across the world's creations myths, attesting to its universality. Tongan and Samoan creation myths tell of the world being created from a stone that split into two, with Melanesia sharing a comparable story. The Kayan tell of a story wherein a spider spun a web. A small stone descended down and got caught in the web and then grew until it spread to filled all the space under the horizon. The Torjadja in the Celebes have a story wherein the Sky Father and Earth Mother crafted two stones, of female and one of male. As they went to secure immortality for the created figures, wind came along and vilified them, denying them immortality. In the Vedic tales, Vishnu takes as his breastplate a brilliant red gemstone called the Kaustubha. 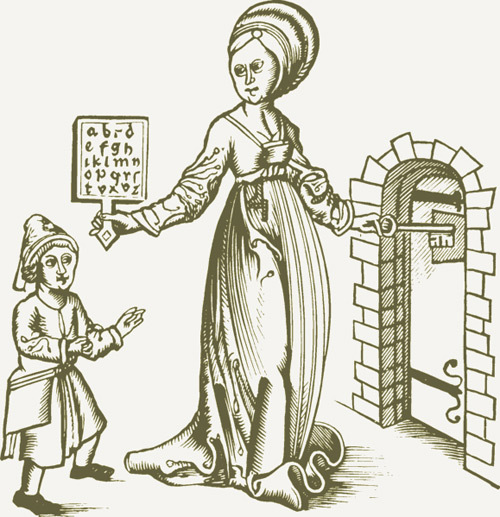 Yet none of these tales remotely touches on the level of sophisticated as developed within Western esoteric traditions and for which we find hidden within the Letter G.
One of the first indications of the Letter G's importance is through an analysis and solving for "the Word". The Word is Pi. Western Illuminati (Osirian) constructions are based on the 26. This 26 leads you to the 26 digit Alphabet which we call "modern English". Within the Alphabet are numerous cipher wheels, but one of the most important is to set your Ankh or Anchor points. This is done by "turning the Alphabet" so that we set the Letter T to the Winter Solstice. In this way, the Letter T represents the Solstices, while the G represents the Equinoxes. You can glimpse more details from seeing my video, "The Esoteric Tale of Humpty Dumpty", or read the article entitled "The Tau, the Ankh, and the Anchor". 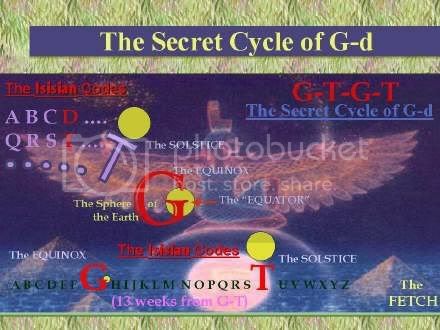 Essentially, the Letter G, being located at the 7th location of the Alphabet, is divided into the number upon which was crafted the date for the first full day of the Equinoxes, or the number 22 (March and September 22). 22/7 = 3.1428571 = Recipricol 7 representation of Pi. In this case, the Letter G is comprised of two conceptuals. The C of the Letter G is as the sphere of the Earth, while the T of the Letter G is as the Sun as it crosses the equator, hence the horizontal part of the T is set at the midway point of the C.
In this way, the Letter G accurately reflects the dual components to the Philosopher's Stone, as well as provides further insights into the phonetic structure of the esoteric code within the language. Part of this phonetic coding is the linking of G to C. In this way, we find that Hebrew Gimmel (G) is given a value of 3, but when we analyze the phonetics, the sound of G (guh) is a soft form of the phonetic C (cuh). There is exhibited a clear, rational, construction to the phonetics, but from a philosophical point of view, the practical way to embed this is into a seperate system (Setianist Hebrew) and then maintain the keys independently for both. 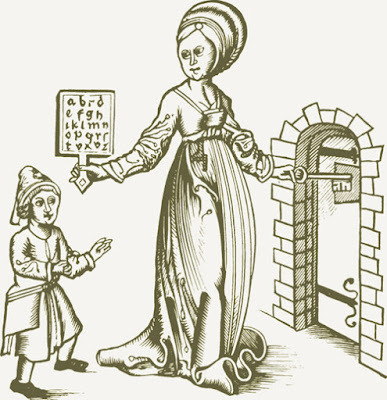 relative to Hebrew (gimmel), an "esoteric modifier" or clarifier MUST BE AFFIXED to the Hebrew Gimmel. Otherwise, where, precisely, is the "4" or "T" component to the Formula for Gimmel (G = 3 = C) when we know we must return the esoterically transposed formulae back to Pi, or "the Word"? 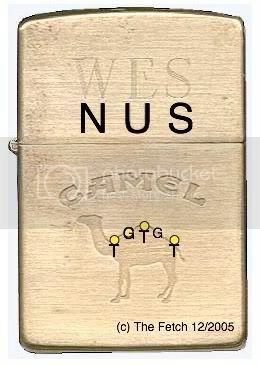 The way this was done was to assign to the Gimmel the value of 3, and embed the T portion of the formula into the esoteric meaning to the Gimmel, which is to call the gimmel a "Camel". The "T" part of the formula becomes represented by the "GIMMEL = CAMEL" = wherein the humps of camel represent the X-Y graph of the Sun as it is measured against noon zenith from Winter Solstice to Winter Solstice. This X-Y graph representation is akin to the Letter T. The Letter T is used to define the heighth of the Sun (the lifting up of the Sun) as a measurement above the horizon. The critical element to remember is that the key is the Letter G and the Isisian Codes. You cannot derive the Gimmel/Camel/Conceptual formula if you were to only peer into the glyph used for sound of G in the Hebrew. The Key remains set in English, and we may compare the two formulas again. Which formula is more concise, and hence, pure? In this way you go about analyzing various Occult formulas and testing them to reveal the inherent "truths". 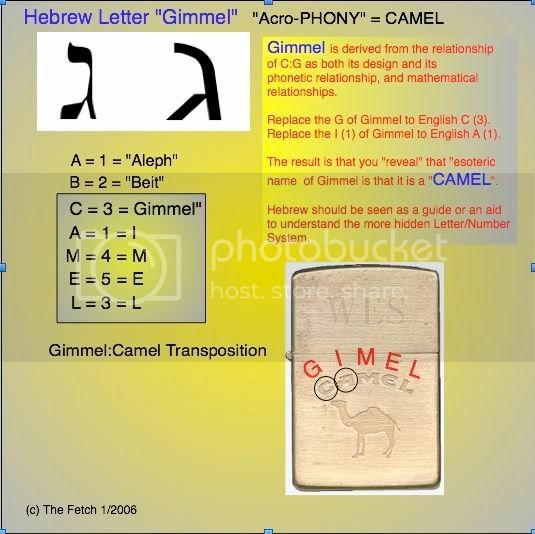 That Gimmel is a Camel is G reveals that the key code is G, and not "gimmel". Therefore, English is being used as the root code even to the Hebrew set and gimmel as the Hebrew conceptual parallel is being esoterically subjugated to the English "god". A further demonstration later in this article will bring this concept even a brighter light. And from the cross-row plucks the letter G."
- Shakespeare, Richard III, I, 1. 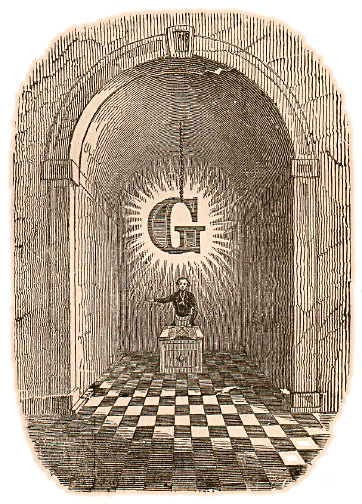 More to the point, the Letter G as a component of the composite symbol of the Letter G with the Square and Compass, is perhaps one of the most exalted of the Letters within Western Mystery Traditions. Speculations and conjectures as to precisely what the Letter G means abound. From the "secret name of God" to "Geometry" all present us with "notaricon" interpretations. When we work with notaricon, for instance, we must extend the practice to the root, or consonant, components of words. The root letters of GEOMETRY are the letters GMT, while these root letters share the same roots with another key Occult concept, or that of GEMATRIA. There is a clear link of GEOMETRY to GEMATRIA, and a key hint is that each of these words hints at the word GM, or GEM. 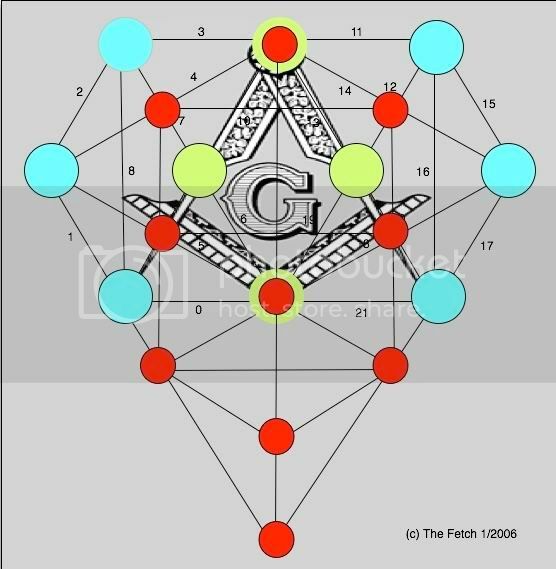 Through this process, we may perceive that one of the clues is that GEOMETRY and GEMATRIA each are linked to that of the GEM, which is the Philosopher's Stone. in the repository of the heart." However, for the purpose of this article, and to provide you with an inner insight into this Letter, we shall focus on one key theme of the Letter G, and it is that of "unity" and "perfection". that point at a certain moment in the Ceremony . Why is he then placed in the centre?" As the Gematria demonstration shows (7 = 3+4 = C+T = G), there is more to the Letter G than the notaricon demonstrations oft spoken of. Equating to the Letter G to mean "God", or "Geometry", or "Gom-el" are clearly insufficient. Notaricon insights are simply insufficient. 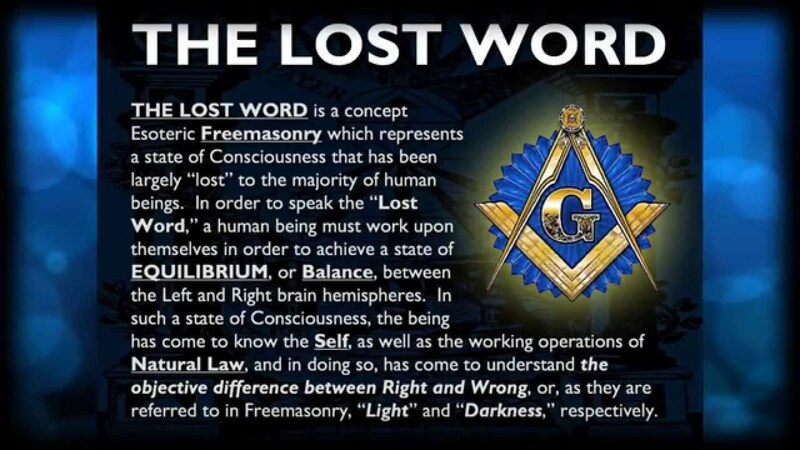 Wilmhurst provides further insights as shown above and goes on to equate to the Letter G an Omphalos property. He also equates to the Letter G a descending stone type of analogy when he says that "In the Royal Arch Degree it again becomes visible, but in another form and in another position-on the floor of the Temple and at its centre, and in the form of a cubical altar, a white stone, bearing the Sacred Name. In the course of the Degrees, therefore, it has come down from heaven to earth." As mentioned at the beginning of this article, "Truth" is established against two components: a geometric component (the Philosopher's Stone) and "the Word". Wilmhurst is providing insights into this very core truth. The Letter G is modified to include a cubicle altar, a white stone, and "the Sacred Name". We may interpret this as the Letter G being affixed again to these two primary foundation points (Philosopher's Stone and The Word). We have shown how the Letter G is the Omnific Word (PI), but how it is representative of the Philosopher's Stone? All you really need to solve for this is the idea of the C and the T, for the philosophy is embed into the Letters. The Compass (the C) and the Square (T) are revealing in plain sight the relationship or union of the C to the G.
In the Letter C, as it is viewed as the Sphere of the Earth, relative to an observation point relative to Earth, the C appears as a plane, or flat surface. "In the significance of this symbol and its transpositions during the four Degrees may, therefore, be discerned the whole purpose and end of Initiation, the union of the personal soul with its Divine Principle." Of course, we already KNOW that the Letter G concerns the principle of Union. How else do you explain the fusing (Union) of the Letter C to the Letter T aside from stating the obvious, that we have created a Union of two principle concepts (C and T)into a larger, and hence, composite, philosophy? What, then, is the Letter C and what, then, is the Letter T when set against the Compass and Square? We now simply need to retrace "mythology" to piece it all together. Adam and Eve are said to have come from the Garden of Eden. Edin is derived from the Akkadian edinu, meaning "plain". A plain, of course, is a flat surface, and so this equates back to the C as being the Sphere of the Earth (but the Compass) as represented by the Compass and Square. When Adam and Eve "fall", they are removed from the Garden of Eden, which is then guarded by the Flaming Sword and Cherub. What is the DREIDLE but a CUBE? Further, the Letter G contains Omphalos properties, so how do you put it all together? Simple. 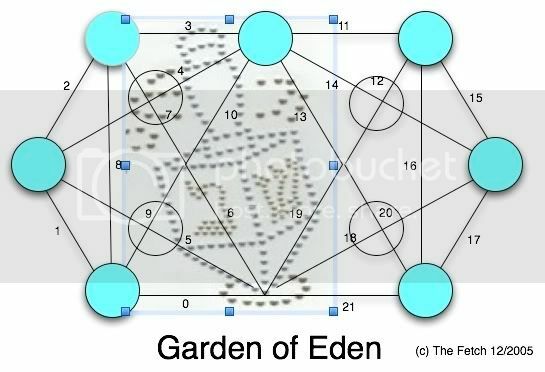 Solve for the Garden of Eden, and then set against it the Flaming Sword and Cherub (cube) of the Rabbinical Tree of Life. The Garden of Eden is as a plain. It is this. 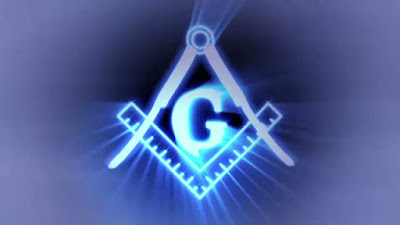 "If, then, the Lodge be a spiritual focus-point, the centre of the Lodge, where the "G" is exhibited, is' its most vital and sacred point ; the point at which Divine Energy may be thought of as concentrated and specially powerful." The key point here is that CANCER (69) represents an Omphalos point, and it is upon this point that the "cube" or the "DREIDLE" spins. The "6" or the "9" represent many things, but ultimately, from the center we say that thought is projected outward (goals are set, for example), and time recedes (goals approach the person) to reveal the forward projected thoughts. Spin the Dreidle one way is akin to throwing your thoughts out. Spinning it the other way is akin to your thoughts receding with the currents of time to meet you where you remain. You have never moved, as it were, but remain in your own center. Hence in the Compass and the Square, the Square represents the cube nature of the "dreidle" or "Cherub". In this way, we complete the the Crafting of the Compass and the Square as a representation of the Letter G.
Now can you pull the "sword from the Stone" ? Perhaps you understand that if WE work together more wonderful progress will be made, as opposed to "opposition" and fear of what may be right and wrong. could you please tell me where you have this picture from? This picture looks very interesting but unfortunately I'm not able to find anywhere. Very interesting, covers some stuff I've been thinking about lately. For anonymous: the pic appears to have come from somewhere at this site. Just an FYI everyone. I almost always retain the links to the photographs used, unless protested to be the site hosting companies where the photos are located. If you click on the photos, you can trace back the web site the photos are coming from. In this case, the photo in question came from the site Cabiz.net, which was a site I linked in through a Google search for pertinent images to the story line. Thanks for the extra efforts to find this picture because the linking site proved to be a terrible site to try to find the photo in question in context. The G stands for Geometry, the science which the ancients believed most revealed the glory of God and His works in the heavens, and it also stands for God, Who must be at the center of all our thoughts and of all our efforts. Masonic Grand Architect of the Universe (God). Lucifer and Satin are two different angels all together. Keep in mind that we've lost approx. 30 books of the bible. When we refer to God, remember he created ALL life, to include Lucifer, which was simply "The flyer of LIGHT". My father, Lawrence Shields was a 32 degree Mason. I am proud of his life's achievements. 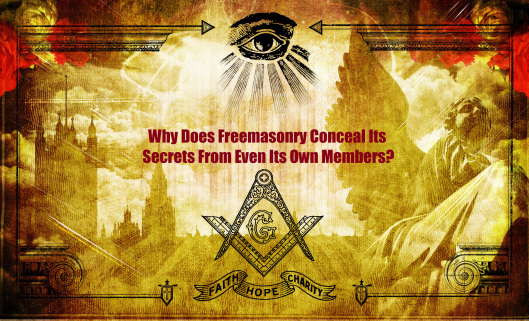 My ancestors helped bring the Masonic movement into NJ. My Grandfather, James Shields led the first Masonic parade in NYC, as he represented the temple in Maple Shade, NJ. As his father Samuel H Shields was a mason, as well as most of the well known Shields family. Our forefathers, paved a way for us to learn. Maybe we should try that. A king for the nation... Lightbearer. A tale of two ladies. A lady with a lotta knowledge and a lady with great sense of justice. DRAGONS. AZOTH ETHER. LIVE BELIEVE. Evil ot gniog ma i. If you read this, I'm in the city of the heat. Wait for me, my music is going to call you my followers. Support me. I need your strength to be untied from those chains. I'm a mere human like my father once was. I am the messenger of greatest stark. I'm the one who shall live forever. I am chaos, order. I am part of the cosmos. Fears and thoughts. Everything. 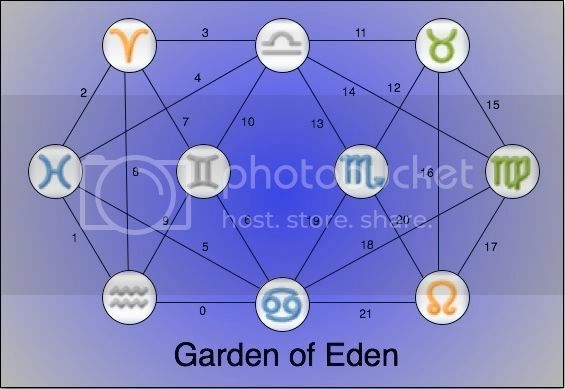 I suppose all readers know why, seeing no one has asked, the horizontal/fallen Gra tree does Not contain either Sagittarius or Capricorn. So on the ball yous are. William Eisen didn't seem to be too far off. The G is the beginning of the spiral from source. From within to without...and back. Could type, full stop here. But this is in keeping with the rune Gebo (looks like X), as an (gift = energy) exchange. One Could... view that stave as two connecting vertices. In line with the root GMT, we've also gamut, gamete, gambit... One can thus (better?) see the semantic connection - and it seems to me Eisen wasn't too far off. There's also garment, which implies a wrap and the inner wrapped. But that's quite the game above. Ever consider that Sagittarius and Capricorn, missing, might have some greater significance? If it was sag and scorpio this would be quite interesting in light of Dr. Paul LaViolett's writings.